The weather is in the 60s and the cherry blossoms are in full bloom. This is the season for hanami and what a wonderful season it is! We headed to our favorite local park for some blossom viewing. EJ insisted on dressing up for the occasion and found the perfect spot to look up along the river. Even in a dress she had to climb some trees. CJ enjoyed the view as well. As long as the weather stays cool and dry we should be able to enjoy some blossoms with DaddyO soon! Baby B insists on feeding everything himself. I love his independent spirit but it does mean that our dining room floor is usually covered with food (letting the rice dry for a day makes vacuuming easier) and he goes through a couple different outfits. I have found the bathtub a great place for him to enjoy the especially messy meals. We packed our bags and went on vacation for a night in Tokyo. The kids always get excited about a trip to the New Sanno, and staying over night is even better. The kids spent hours in the pool playing with friends and I enjoyed the room service. One day closer to seeing Daddyo! You know you have lived in Japan when you can identify everything in this Japanese dessert...azuki, anko, mochi, sakura cream, salted sakura blossom, peach slice and a cherry. Just another dessert from the convenience store. Oh how I love Japan. Surprisingly enough there are quite a few ways to celebrate St. Pattie's Day in Japan. We had our choice of parades and festivals in Tokyo and Yokohama. Grandma and Grandpa took the kiddos to the Omotesando last year so I thought I'd check out a new one and headed ot the Motomachi parade. We met up with a couple friends decked out in green along the way. We arrived just as the parade was about to begin and found perfect seats along the road. Group after group marched by with Irish affiliations ranging from pubs to dogs. EJ squealed with excitement when she saw her reason for coming. The Irish dancers. She was treated to a nice long Irish jig. After the parade was over the kids were kept busy taking pictures with the Japanese spectators. I guess blond haired kids decked in green are just the picture they want. The school year has come to a close. So much has happened since this first day. It's amazing to see how much our little girl has grown up. The last day of school is a special day for the kids, teachers and parents. EJ's started off with a bus ride. At the end of the half day, all the moms met at the classroom to bid farewell to the teacher. The kids sang their Blue Balloon farewell song then speeches and presents were given. It was very evident how much their sensei cared for the class. Tears were shed and hugs exchanged. The school gave each student a special present to remember their year. EJ received a hand towel with her name embroidered on the bottom as well as some pencils, drawing pad, and gift card to a bookstore. She also brought home all her artwork from the year in the form of a book. A real treasure! Since EJ is in the middle class this was not her final farewell. She will get to see her sensei at school and probably be in the same class as a third of her fellow students. I was thrilled when I saw this book available to read to the kids. Bragging is something I have been talking about with EJ and little help explaining it is always nice. Nothing grates on me more than the "me" person. I think we all have met one. No matter what you say that person has a story to top that pretty much sounds like "me, me, me, me me." The comedian Brian Regan explains it best. Nipping bragging in the bud was important to me. "The Biggest Brag" started off showing how talented brother and sister bear were and how proud they could be of their hard work and effort but how easily that could turn into pride and bragging. 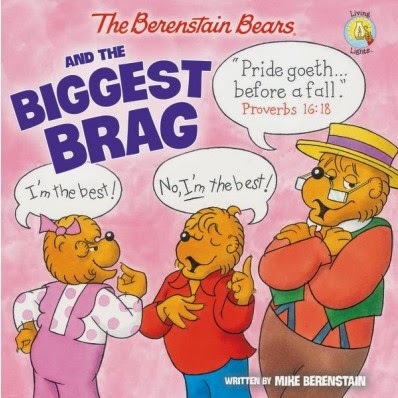 After the bear siblings have a fight over who is better they are challenged by Grizzley Gramps about what they are bragging about and are reminded that where there is strife, there is pride. We had some good discussion from this book and EJ is more aware of what she says about her accomplishments. In this age of Facebook, Twitter and blogs it is great that she is learning this lesson early. March is here and that means it is time to get out our St. Patrick's day box. The kids were quite excited to deck the house in green. Almost as excited as they were to deck out each other. Hinamatsuri or Girl's Day is celebrated every year on Mach 3 in Japan. It is a special day when families display their heirloom ornamental dolls representing the emperor, empress and royal court. Girls dress up in their kimonos and a special meal is prepared. Dolls are passed on from generation to generation to the first born daughter and a simple two doll display starts at $600. Instead of purchasing a display the kids made a set out of toilet paper rolls. In true CJ style he deviated a bit from my original design and decided to make binoculars instead. He put them right to use watching planes from our balcony. Some origami paper for the kimonos, and old sweater for the hair, and and some beads and ribbons later and we had the perfect royal set to display in our entrance-way. They kept disappearing though since EJ decided they were much more fun to play with. I let her play away. Another advantage of cheap and easy decorations!